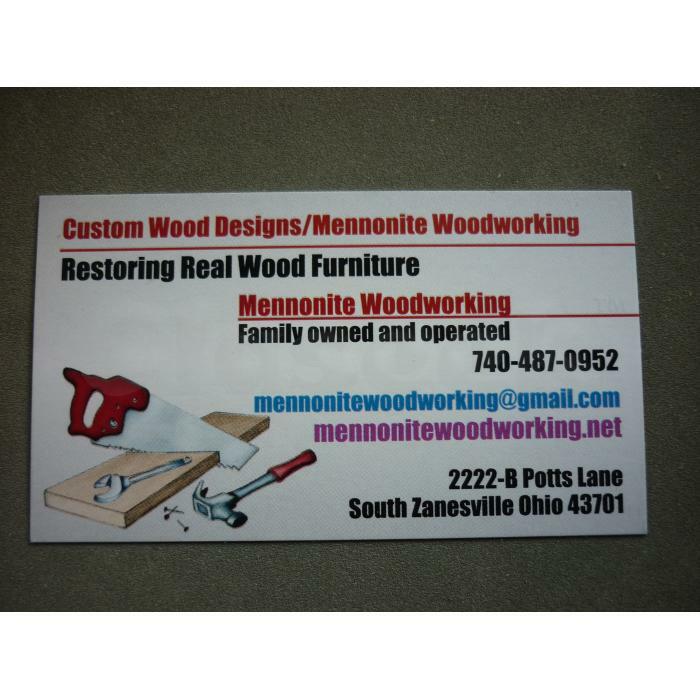 CUSTOM WOOD DESIGNS/MENNONITE WOODWORKING IS A SKILLED WOODWORKING SHOP LOCATED IN SOUTH ZANESVILLE OHIO. WE ARE OPEN TO THE PUBLIC FOR BOTH SMALL AND LARGE JOBS FROM ONE ITEM TO MANY ITEMS. WE ONLY WORK WITH REAL WOOD. WE DO ACCEPT ALL MAJOR CREDIT CARDS, CHECKS, AND CASH FOR ALL OF OUR WOODWORKING SERVICES. WE ARE OPEN MONDAY-SATURDAY FROM 9 AM TO 5 PM CLOSED ON SUNDAYS AND ALL HOLIDAYS ALSO WE ARE CLOSED ON ALL BAD WEATHER DAYS WINTER IN OUR AREA CAN BRING ALOT OF SNOW AND ICE. A FULL RANGE OF WOODWORKING SERVICES AND FURNITURE REPAIR.